A Cuyahoga County Councilman is calling on administrators to get rid of Warden Eric Ivey after 5 On Your Side Investigators discovered inflated claims on the resume Ivey submitted when he was hired to oversee the troubled jail. 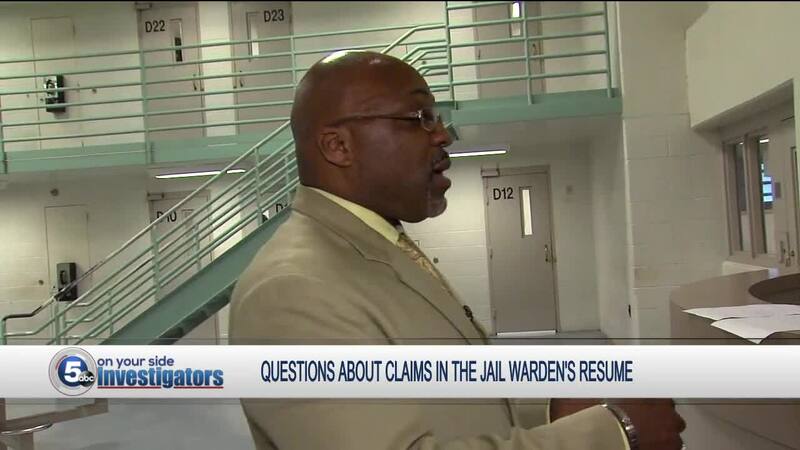 CLEVELAND — A Cuyahoga County Councilman is calling on administrators to get rid of Warden Eric Ivey after 5 On Your Side Investigators discovered inflated claims on the resume Ivey submitted when he was hired to oversee the troubled jail. "Disappointed, absolutely," said Councilman Michael Gallagher who chairs the council's Public Safety Committee. "Lying on a resume or fudging on a resume usually is immediate discharge. That's an administration move. If it had happened on council's watch, he wouldn't be there." On the resume submitted in February, 2017, and obtained through an open records request, Ivey boasts he "spearheaded the preparation and readiness for the Ohio State Jail Inspection in 2015 and 2016, first time center received full compliance." Ivey lists the accomplishment twice on the three page resume. But a check of state inspection records shows it isn't true. The 2015 inspection found the jail wasn't compliant 13 standards. In 2016, inspectors cited Cuyahoga County's lock-up for violating two "important" standards. A spokesperson for the Ohio Department of Rehabilitation and Correction confirmed the findings. "It seems to me, that from what I've read and everything that I've gotten, that Mr. Ivey wasn't truthful on his resume for the job in which he has. That disqualifies you in my book," said Gallagher. 5 On Your Side Investigators made Ivey aware of the allegations Tuesday. Through a county spokeswoman he declined comment. Ivey's performance was already under scrutiny after a damning US Marshal's review of the jail found the warden did not make weekly visits to the jail's housing units, that the warden violated the constitutional rights of inmates by disciplining them without a hearing, and, investigators said, for imposing meal restrictions on inmates as punishment. On his resume, Ivey also boasts of conceptualizing and implementing the jail's Special Response Team. In their review, Marshals wrote members of the team were seen verbally abusing and demonstrating aggressive behavior toward inmates, withholding or denying personal hygiene items to inmates and showing, what inspectors called "deliberate indifference to humane needs." Gallagher was quick to point out that county council doesn't have the power to hire and fire employees, but he says it's clear what needs to happen. "This should be taken care of at the administrative level," said Gallagher. "And I would hope it will be in the very near future if not today." Wednesday afternoon a Cuyahoga County spokesperson said she wasn't aware of any plans to discipline Ivey. She said the county vetted Ivey's resume, vetted his credentials and vetted his experience and hired him to be the warden.